Striped Nails for the #31DC2016Weekly - Polish Etc. For this weeks prompt, Stripes, I wasn't sure what to do. I kept thinking of the same look I did last year, stripes and flowers. But I decided to do a take on a nail art look I did a very long time ago. Stripes of color and little details. I started with a base of OPI's My Boyfriend Scales Walls and a quick dry top coat. For the stripes, used Nail Vinyls to block of sections and painted them in with neon color. the neon green, neon pink and neon yellow are all acrylic paint that you can get from any crafts store. I used these because it is so easy to fix mistakes. All you need to do is gently scratch off the dried paint and start over. On each nail, I did a tiny little design in one the stripes. Leopard print, cheetah print, tiny dots and stripes all done with a tiny little paint brush. Once it dried, I topped it all off with a glossy top coat. What do you think!? I like how these turned out but I wish I would have put a thicker top coat on. The acrylic paint is a little raised and rough. But the neon colors are bright and fun for summer. 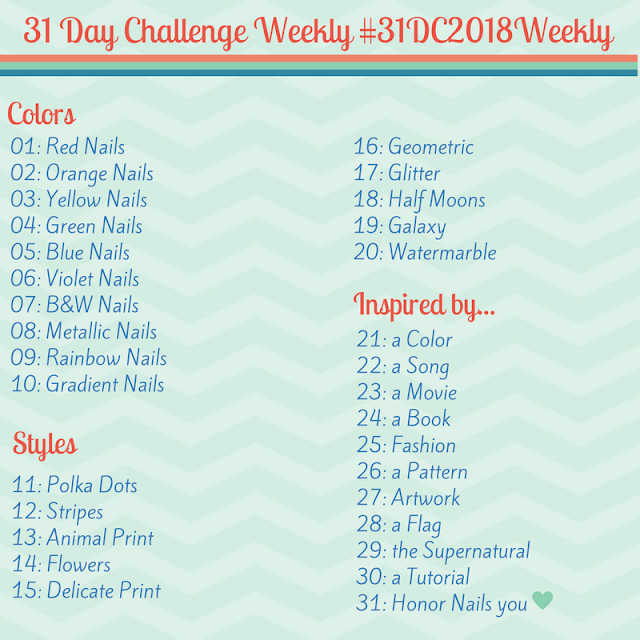 Make sure you check out the #31DC2016Weekly tag on Instagram, Twitter and Facebook to see all of the other great nail art looks for the challenge.